What a better way to celebrate the final days of summer than with the best end-of-summer party on the east side of Cayuga Lake! 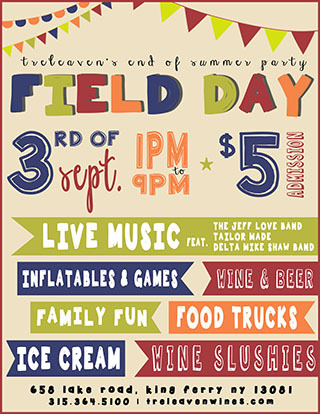 Round up all your family and friends - young and old - and join Treleaven at the second annual Field Day on Saturday, September 3 from 1-9pm. Take in the sounds of the local area’s most prominent rock & roll, swing and funk musicians. The Delta Mike Shaw Band will get the party started at 1PM with their classic 1960’s rock and roll. Central New York’s best country act, Tailor Made will begin at 4pm, followed by headliner, The Jeff Love Band, starting at 7pm. The 11-piece dance band will be cranking out R&B, Latin influence material, swing and funk. Be prepared for a feet-can’t-stop locomotive from the first song! Food lovers are invited to grab a bite of tasty eats from local food trucks including Alexander’s Food Truck and Over the Moon Grilled Cheeserie, while Meg-A-Moo’s Ice Cream and Silver Street Rd. Kettle Corn will be catering to everyone&apos;s sweet tooth. In addition to the great local fare, there will be wine specials, wine slushies and beers on tap, including Cortland Beer Company, Two Goats Brewery, Grist Iron and Bandwagon. There will also be plenty of lawn games for you and your family to enjoy like corn hole and lawn-sized jenga, as well as inflatables for the children. Admission is $5. Children 12 and under admitted free. Check their Facebook page or www.TreleavenWines.com for more details about the event, and last minute announcements. There won’t be a better way for your family and friends to toast the end of a great summer! * Seating available on a first-come, first-serve basis. You may bring your own blankets and chairs. The oldest winery on the east side of Cayuga Lake, Treleaven has been crafting fine vinifera wines and fun proprietary blends since 1988. Along with two flagship varieties, Riesling and Chardonnay, they are also well known for their hearty reds, like Cabernet Franc, Pinot Noir, and Merlot and fun, fruit-forward wines. Browse the extensive gift shop featuring local and handmade products, join in for one of the many special events held throughout the year and enjoy a glass of wine in the spacious outback. The Treleaven family invites you to taste the award-winning wines in a casual and friendly atmosphere - once experienced, never forgotten!